Doctors Outpatient Surgery Center specializes in ophthalmology and facial plastic surgery. We are dedicated to providing the highest quality and standard of care at an affordable cost. 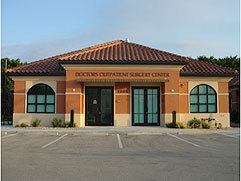 Doctors Outpatient Surgery Center has been in operation since 2005. We are certified by Medicare and licensed by the State of Florida. We are proud to be accredited by the Accreditation Association for Ambulatory Health Care which reinforces our commitment to providing the highest possible levels of quality care to the community we serve. Status as an accredited organization means we have passed a series of rigorous and nationally recognized standards of quality health care. We strive to make your visit at Doctors Outpatient Surgery Center as pleasant and comfortable as possible.